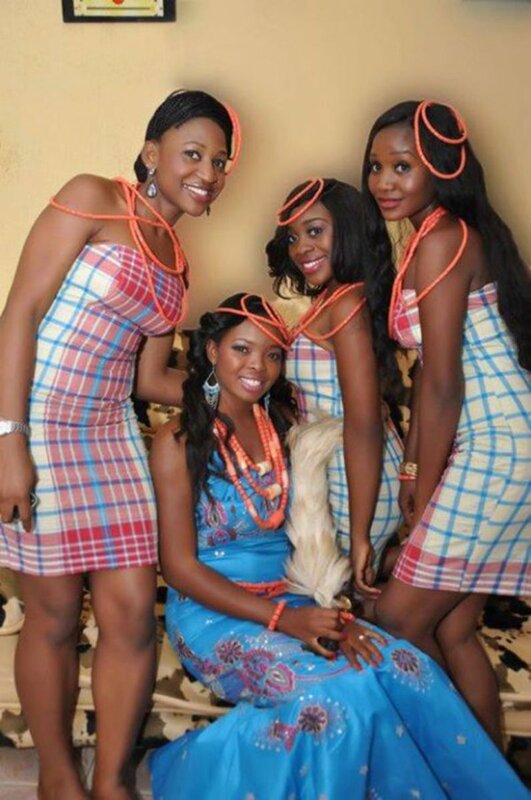 During Igbo traditional weddings, amazing high fashion and traditional outfits are worn that are fully representative of both families and friends. 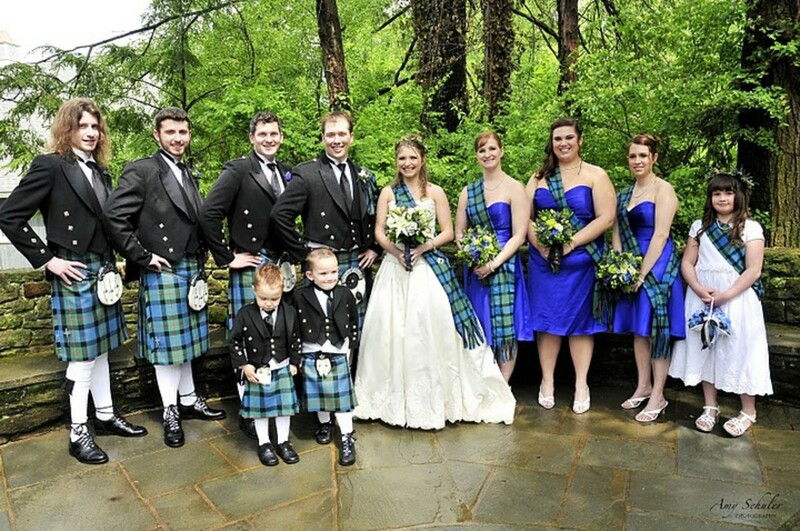 The guests, family members, the bride, and groom display different fabrics and designs. The festive celebration full of joy, happiness, and fun is incomplete without the display of high fashion on such occasions. Nigerian designers and tailors highlight their creative spins on the customary blouse, wrapper, skirts, dresses, and even head ties. The styles are ingenious, brightly colored, and full of endless variations that bestow nobility to the men folk and flatter the female form. The outfits worn by the women are eye-catching, elegant, regal, and thoughtfully designed. On such occasions, there usually is a dress code chosen by the bride and groom. In addition, there are many similarities in modern traditional wedding outfits between the Yoruba ethnic group and Igbo ethnic groups. Both ethic groups chose color codes, wear blouses, skirts, agbada, and wrappers and use lots of embroidery and accessories. 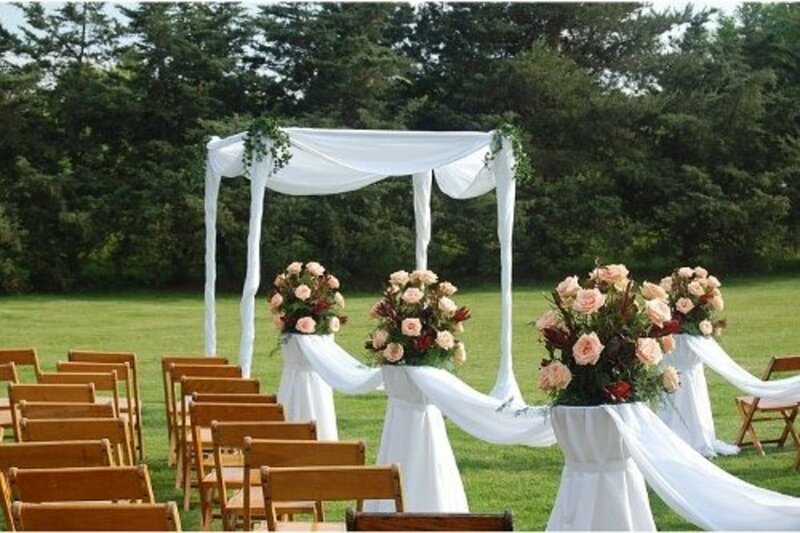 The major difference is the ceremony and traditional requirements, which are different, yet serve the same purpose. Uniformity of propose and solidarity with the bride and groom dictates that the brides family and grooms family choose the color code for the event. 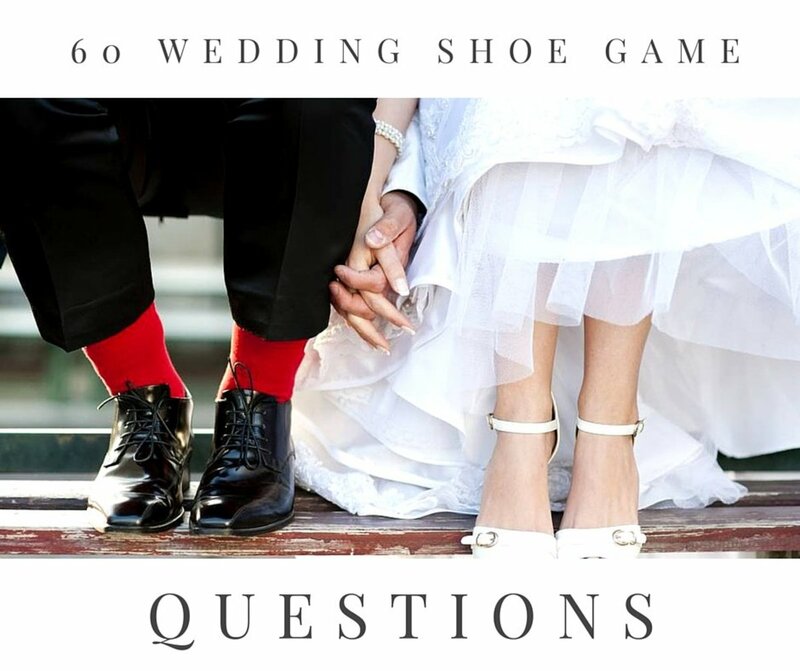 The colors chosen by the bride’s family might be a different color to that of the groom's. However, each color should represent the color theme for the occasion, like purple and gold. 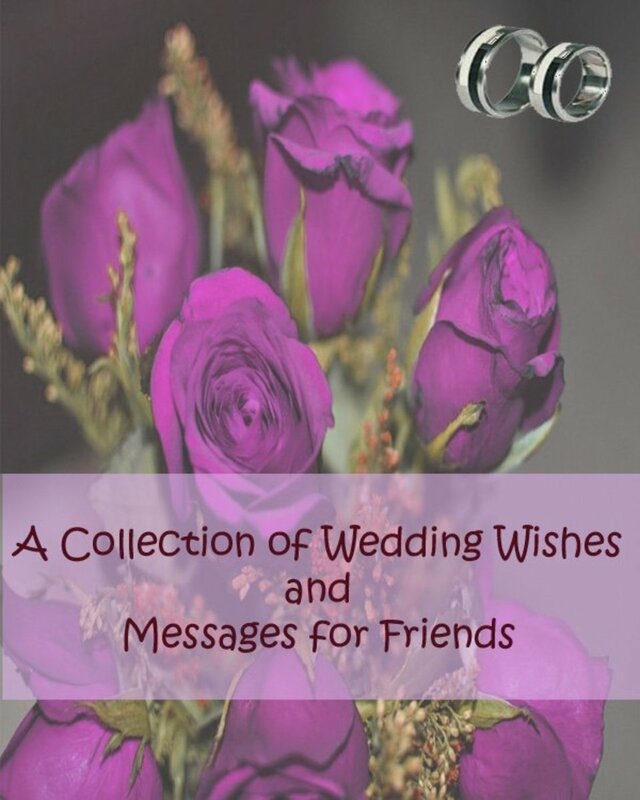 Even though the bride’s family, friends, and associates might chose to wear purple, the material is the same. It applies to the grooms, friends, and family if they choose gold as their theme color. 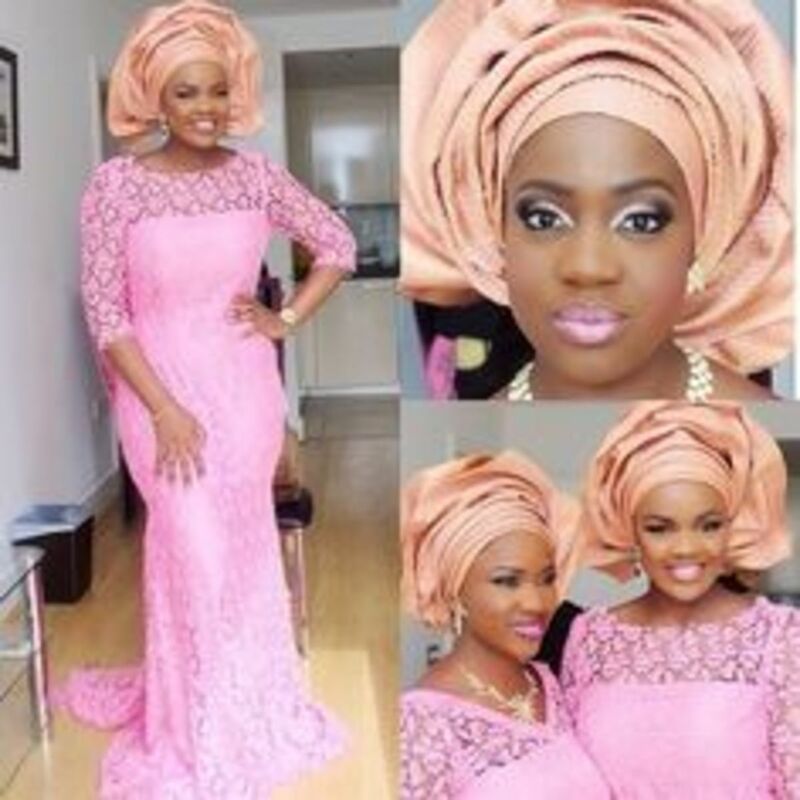 The same applies to material chosen by the bride for her people called the "Aso-Ebi." Although the selected Aso-Ebi is the same material and distributed to family for the traditional wedding, the gusts are able to create amazing designs using this uniform material. Sometimes they use a local fabric called tie and dye as a uniform outfit. The dress code should have an ethnic design that complements the rich culture of the geographical area the bride heritage. The traditional outfits worn by the woman are usually blouse and wrapper, or a dress. They have a large choice of material from silk, George, damask, print, machine print, lace, and any material the favor. The top blouse could be sown as a short sleeve blouse, sleeveless blouse or long sleeve blouse. If the color choice is gold and blue, the blouse usually is gold and the skirt or wrapper blue. The blouse comes in various designs with embroideries that add a more dramatic flare to the blouse. The embroidery can be only on the short sleeves, neck region, or the entire blouse depending on the brides taste and preference. The blouse can be, low or high bust line or moderately cut and should add to the woman’s beauty. A decorative piece as a brooch, flower, or rose increases the beauty of the blouse. If a decorative piece is not part of the blouse then a beautiful hand fan adds to the effect dramatically. The wrapper are usually a different color to the blouse and might be plain, have folds, frills, embroidery, or overlaps depending on the woman’s taste. The wrappers are tied waist high, and in modern wrappers, they can be held firm with extensions or rubber bands. The wrappers can be a single- or double-piece depending on the choice of the wearer. Therefore, if the color code is pink and purple, then the blouse is pink and the wrapper is purple. The skirts can be expressive and either long, flowing, knee-length items or flirtier ones for the young women. The designer can virtually do anything with the skirt, even adding pieces of other materials to add to the dramatic flair. Young women and bridesmaids prefer skirts to wrappers, while married women both young and old prefer the elegant wrappers. George wrappers are usually the first choice materials favored for such traditional weddings. The total outfit is not complete without accessories to bring the attire alive; one of the most important accessories is the orange coral beads around the neck. The coral beads are usually large and prominent, giving balance to the whole ensemble. On the wrist, the bride might chose to wear ivory wristbands, bracelets, bangles, or silver and gold chains. 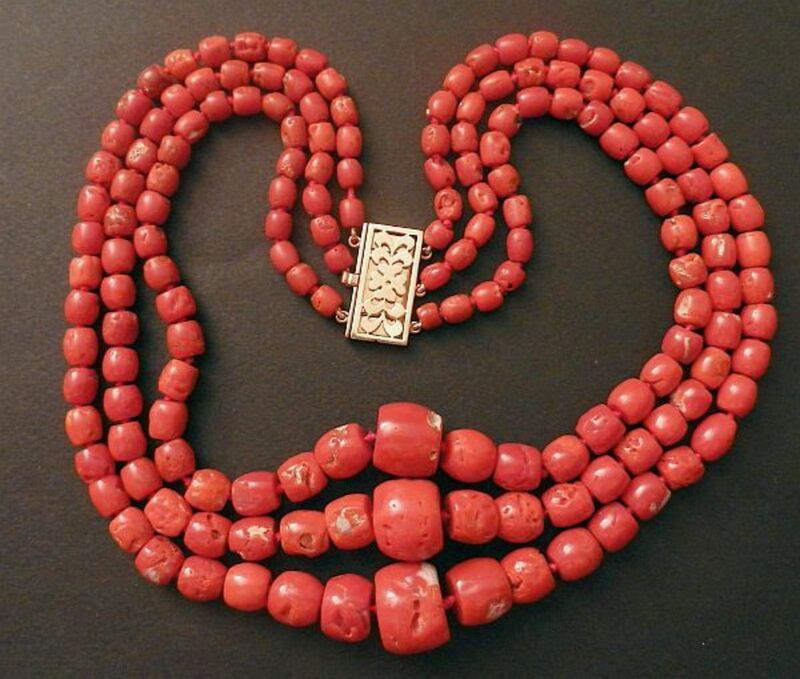 Female gusts can chose slightly understated coral beads worn on the neck and wrists or crystal beads and a brooch. The handbag should be small and match either the blouse or wrapper to have uniformity. Large bags are not ideal, but are useful in carrying gifts for the bride and groom. It also applies to footwear because footwear should also match the color combination, especially the color of the blouse. Low-heeled shoes are ideal for such occasions because of the social dancing and other vigorous activities. A heavy brooch is introduced into the coral beads and a rose can be placed on the blouses shoulder for dramatic effect. 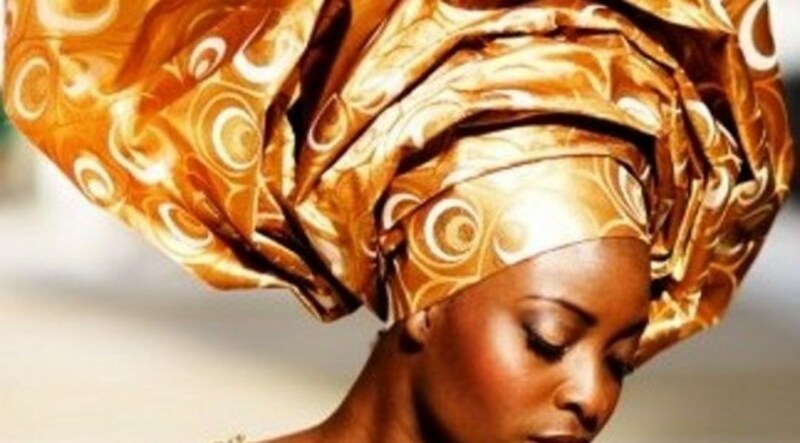 The head tie is an important part of the outfit and is important when wearing a blouse and wrapper. 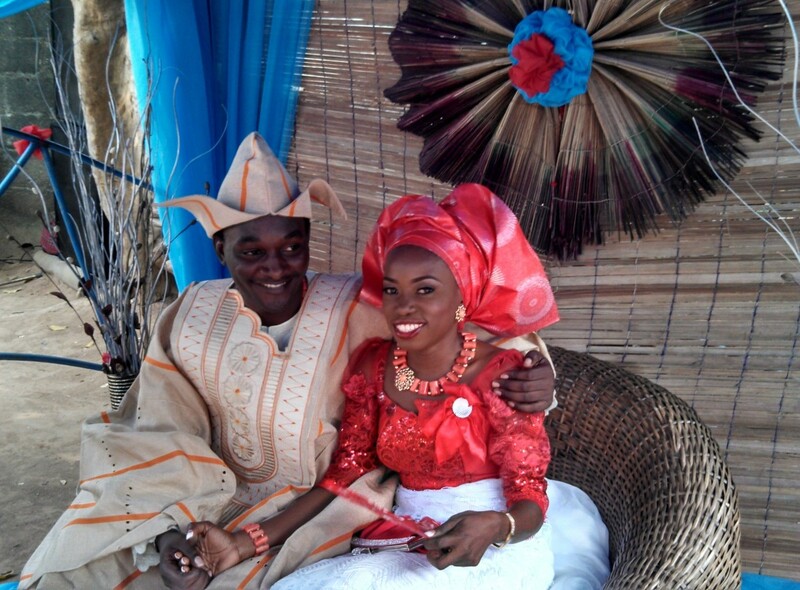 The head ties in traditional weddings are usually the color of either the blouse or wrapper. Any combination works once the chosen color code for the event is strictly followed. Head ties are usually lightweight material like silk, polyester, or nylon is mono-colored and plain. 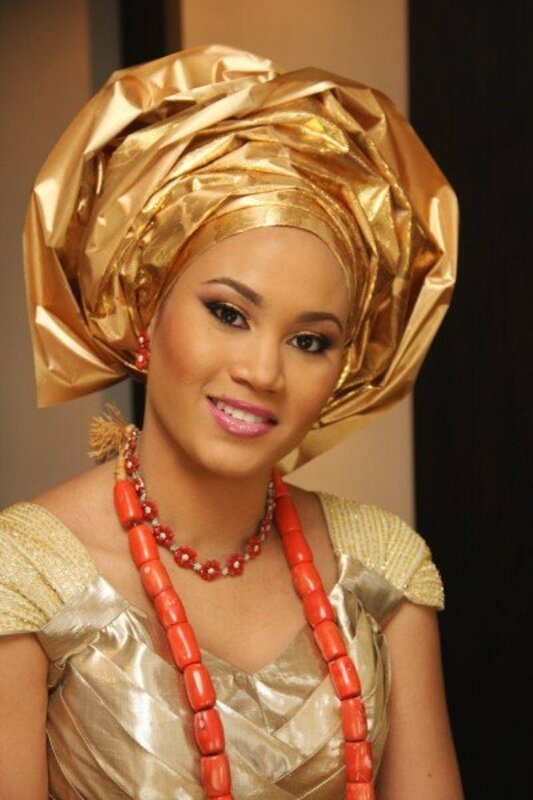 Instead of wearing a head tie, the bride sometimes wears a beaded cap made from coral beads. She might choose to braid her hair and wear beads that are introduced into the braid. Makeup is an essential part of the whole process giving the bride a beautiful, alluring look. A professional makeup artist uses basic tones according to the woman’s facial requirements. The make up artist should introduce elements and colors similar to the color code for the occasion. 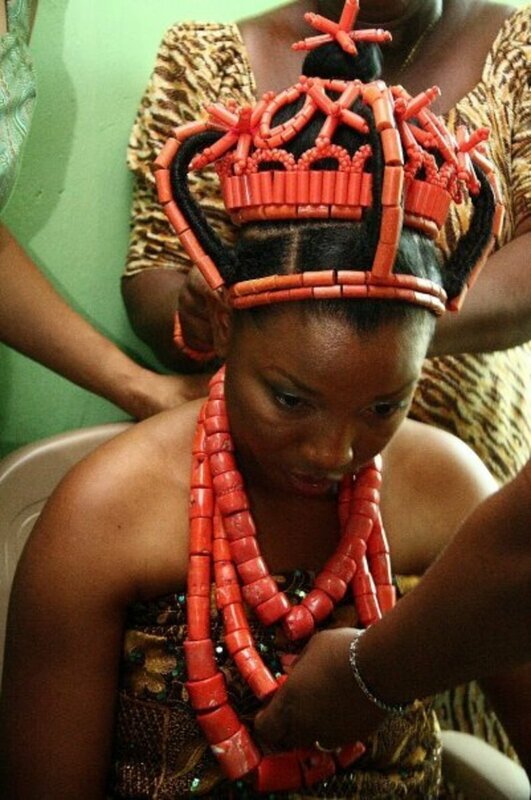 In a more native setup, the bride wears short, knee-length skirts, a short blouse, and have her midsection covered in coral beads (known as "Gigida"). 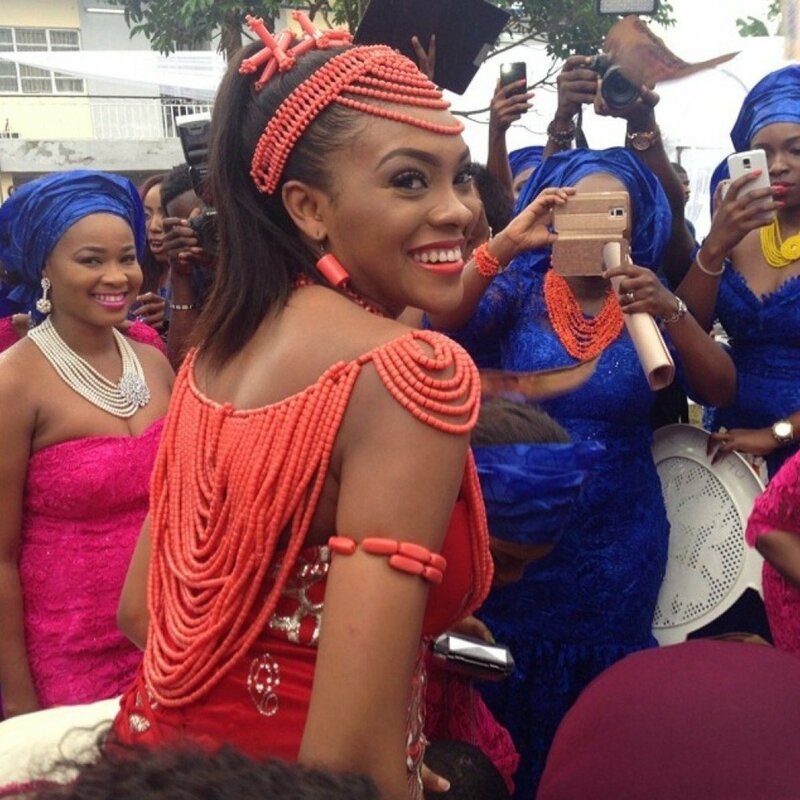 She also wears coral beads on her neck and ivory bangles on both wrist and ankles. She might also choose to carry a feather hand-fan for effect and to accompany her dancing. The men are part of this fashion melting-pot and are nicely clothed in loose-fitted, knee-length shirts and flabby trousers. The men use only one of the chosen colors or materials, which they sow into any native outfit they favor. A cap is also part of the outfit, but does not necessarily have to match the outfit. Therefore, the caps come in red, black, gold, and other colors common to such occasions. 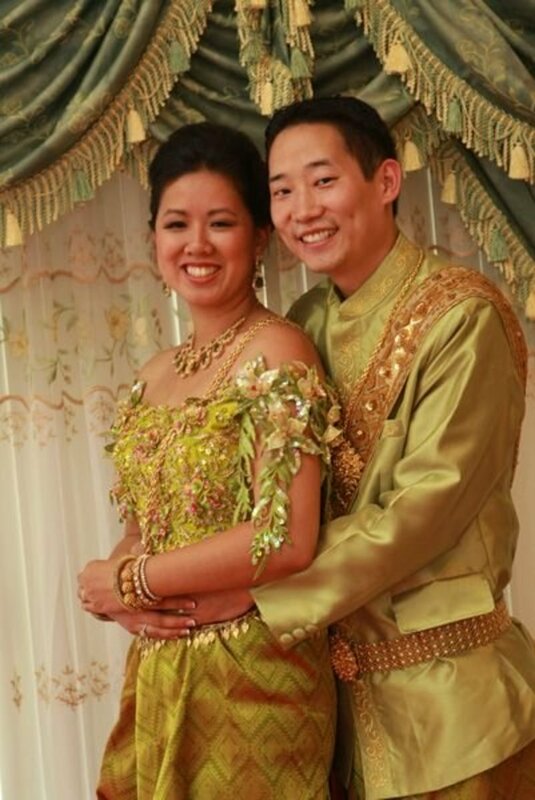 Some prefer suits, regular shirts, and trousers, but wearing the color code shows kinship with the couple. 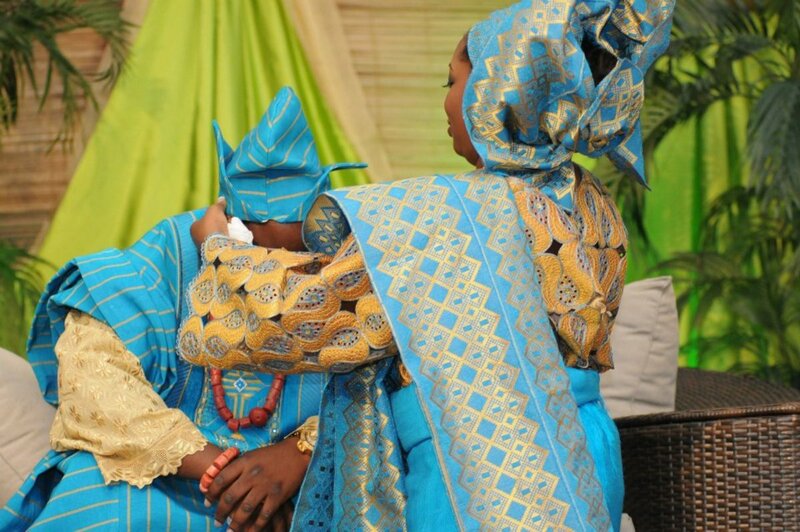 The groom might add a heavy Agbada with lots of embroidery on top of his native shirt and trousers. Gold head tie, gold blouse, and blue wrapper. Silver head ties, silver blouse, and magenta wrapper. Pink head ties, pink blouse, and purple wrapper. Gold head tie, gold blouse, and gold and red skirt. White blouse and magenta skirt/wrapper. Wedding dresses might have two color designs. The bride might wear a monochrome colored outfit (dress). Wine head tie, wine blouse, and blue wrapper. Interestingly, a recurrent color choice favored for the blouse is gold, and purple wrappers are very popular. Instead of coral beads, beautiful chokers with crystal pendants, including heavy embroidery on the blouse make a great outfit. 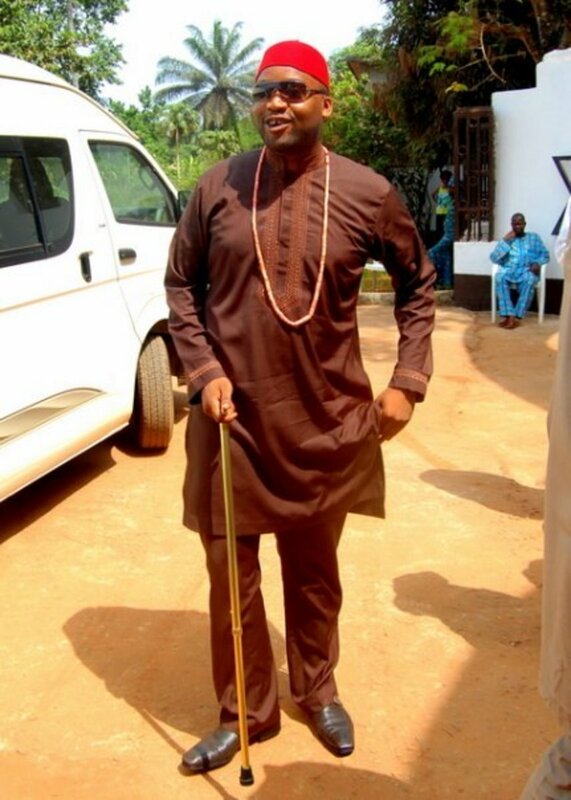 Traditional Igbo wedding outfits are lovely, lively, and a delightful part of the important ceremony. I love the attires that these women's use its amazing. It depends on your geographical location. However in Nigeria there are many fashion designers and seamstresses that create beautiful cloths on demand. locate bridal shops in your area through simple Google search. I love the attires that these womens use its amazing. 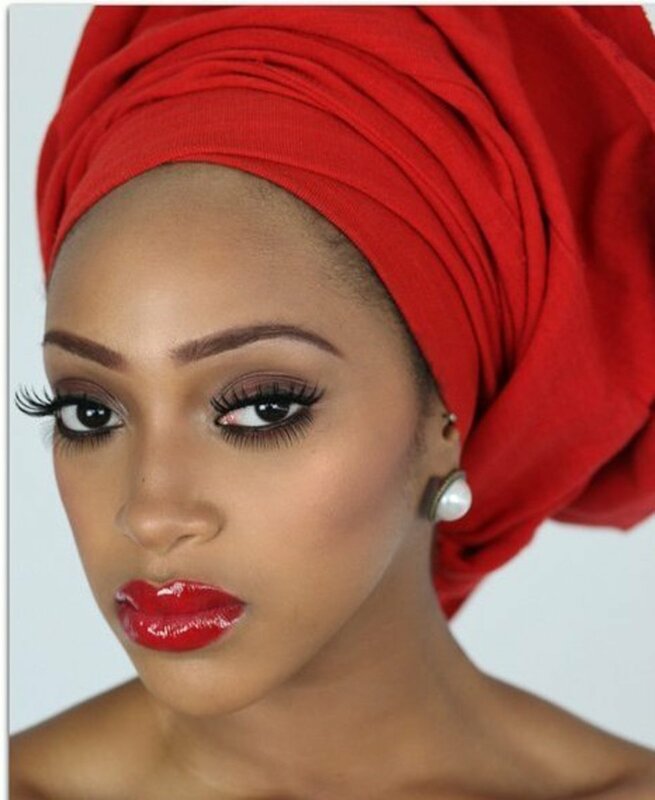 Thanks for your comments word55 & dark and me, Nigerian women are naturally beautiful more-so on such glamorous occasions. Hi Tony, interesting, The women are very beautiful. They must eat quite healthy there.